Serving the professional automotive technician, fleets, government and industry with high quality parts, supplies, chemicals, tools and equipment. Featuring experienced and ASE Certified counter personnel, knowledgeable outside sales people, and dedicated owners. We are your supply partner, not your competitor. All locations offer delivery service to the trade. 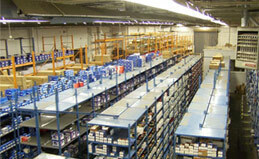 Most locations offer machine shop services. Automotive paint, speed and custom parts, and marine supplies are available from a number of locations. We also carry snow plows and parts, and golf cart parts. Please call your local POJA warehouse for more information. The primary mission of the POJA group is to help its members stay ahead of their competition. We do this by using our collective group purchasing power, to negotiate the lowest possible pricing for our members from its parts manufacturer's representatives and suppliers. We accomplish this by helping our members stay up with the ever changing market, by conducting monthly focus meetings, sharing ideas, strategies and networking with our members and suppliers. In doing this we ultimately provide better service to our customers, thus making us the premier parts suppliers in the area. 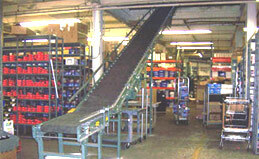 A conveyor is needed to bring product down from an upper portion of the warehouse! 10,000 sq feet of a total of 53,000 square feet of floor space. This area has a small mezzanine already and can double it's capacity.